Having compared the performances of the market’s latest 120GB SSDs in our previous report, we now turn our attention to the mainstream 240GB SSDs. The SP610 from ADATA, which uses the SMI controller IC chip from the popular SMI2246EM series and features MLC-based NAND Flash, comes with a total capacity of 256GB. During testing, the SSD's highest read and write speeds were 503.06 MB/s and 277.65MB/s, respectively. The numbers are noticeably better than the highest read and write speeds recorded from the 128GB model. 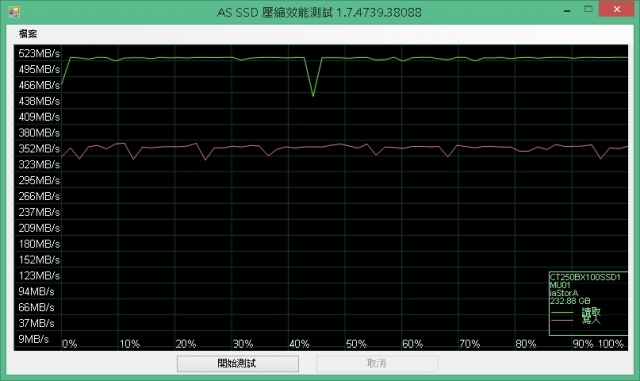 Under the AS SSD test, the 256GB version of the SP 610 performed relatively well, earning a total score of 927. SP610’s performance score here, which reached over 4000, was equally impressive. 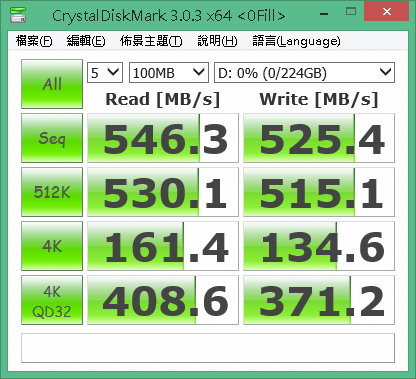 When tested with CrystalDiskMark, SP610’s numbers were similar to those from AS SSD. Aside from the numbers in the 1024 category, SP610’s scores in the 512K, 4K, and 4K QD32 categories were all as expected. Chuangjiu Technology's Formula 256GB SSD uses the latest SMI controller IC chip and MLC NAND Flash memory, and features the SATA 3 Interface rather than the M.2 interface. 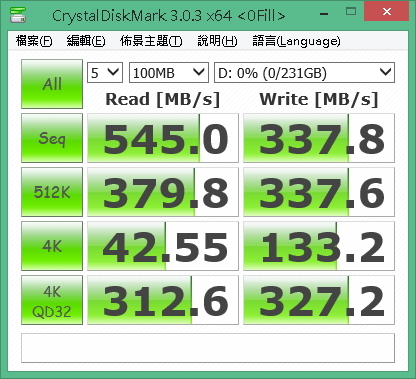 Both the SSD’s reading and writing speeds are impressive, with the former capable of reaching up to 525MB/s. Under AS SSD, Chuanjiu’s 256GB SSD managed to earn a total score of 985, which is better than some of the SSDs tested. The Formula 256GB SSD performed well in this benchmark test and earned a total score of close to 4000. Its IOPS score and read and write performances were also good. When tested with the CrystalDiskMark test, Chuanjiu’s SSD performed exceptionally well and showed sequential writing speed of up to 500MB/s. The SSD from Gigastone that we tested this year was its Prime Series SS-6200, which features 256GB capacity, a SMI2246EN controller IC chip, and Intel’s MLC NAND Flash memory. Its reading speed is able to reach as high as 535.95 MB/s. When tested with AS SSD, the SS-6200 showed a much better than average performance, earning an impressive score of 976. SS-6200’s score under this benchmark test exceeded 4300, which is much better than expected. Under CrystalDiskMark, Gigastone’s SSD performed well with a writing speed of over 300 MB/s. 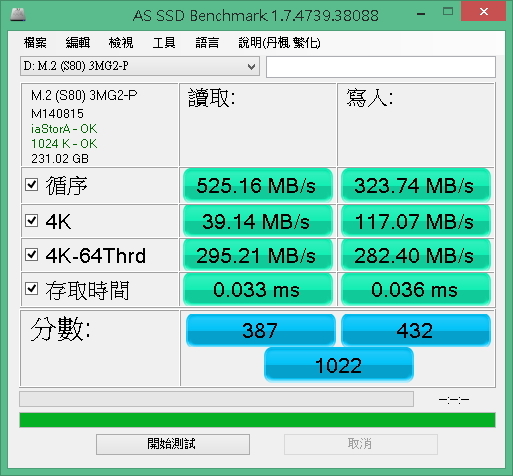 Innodisk this year sent us its M.2 based S80 SSD series, which features storage capacity of 256GB and MLC NAND Flash memory. Although the S80’s reading speed has a tendency to fluctuate from time to time, its writing speed for the most part is stable, as can be seen in the diagram above. The SSD's overall score, which reached an impressive 1022, is much higher than the other SSDs tested. When evaluated with Anvil’s Storage Utilities, the S80 SSD has managed to impress once again with a score of over 4400. S80’s Sequentia reading speeds under the CrystalDiskMark test managed to rise to as high as 545MB/s, while its writing speeds were mostly in the range of 180MB/s. The writing speeds have remained stable even during the 4K QD32 test. China’s Kingfast delivered to us its F9 SSD, which features 256GB of storage and MLC-based NAND Flash. Under AS SSD, the F9 showed a good performance and ended with an impressive score of 939. The 256GB SSD that we received from Kingspec this year was its ACSC4M256S25, which features the SATA 3 interface and MLC-based NAND Flash. Kingspec’s SSD earned a highly impressive score of 975 in the AS SSD benchmark test. While its writing speeds have a tendency to fluctuate from time to time, for the most part they remained stable. The overall score earned by Kingspec’s new SSD here arrived at an impressive 4200. Kimtigo’s latest large capacity SSD, called DS Fusion, features a storage capacity of 240GB, and uses MLC based NAND Flash. Both the read and write speeds of Kimtigo’s DS Fusion SSD were impressive, as can be seen in the diagram above. The SSD's score of 1061 is a testament to its remarkable performance compared to the other SSDs. When tested with Anvil’s Storage Utilities, the DS Fusion SSD earned a total score of over 4300 and showed highly impressive IOPS scores. The SSD from Micron's Crucial BX series that we tested this year was its 240GB BX 110. The SSD features the company’s own 16nm MLC NAND Flash component, and uses the controller IC chip from Silicon Motion’s SM2246EN series. Under AS SSD, both BX100’s reading and writing speeds were highly impressive, and its 983 score is one of the highest scores among the SSDs tested. BX100 performed relatively well under this benchmark test, earning a total score of more than 4200. In the CDM test, BX100’s scores were mostly impressive, and the SSD performed especially well under the Seq category. The 256GB SSD from Morebeck that we received this year features SMI’s controller IC chip and MLC NAND Flash memory. When tested with AS SSD, Morebeck’s SSD showed a mostly decent performance, earning an overall score of 921. Under this benchmark test, the score reached over 4000, which is impressive. 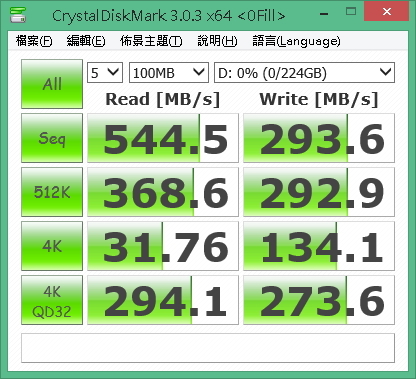 Morebeck’s SSD performed similarly well under the CrystalDiskMark test, particularly in the 4K QD32 category. OCZ is a popular brand favored by both tech enthusiasts and general consumers. This year, the company sent us its ARC 100 SSD, which features 240GB of storage and uses OCZ's Barefoot 3 M10 controller IC solution. The SSD also features Toshiba's A19 MLC NAND Flash chip. OCZ’s ARC 100 showed the most impressive results in this test when compared with the other SSDs, and its reading and writing speeds, for the most part, were stable. By the end of the benchmark test, the SSD managed earn a total score of 1060. Its reading speeds under the 4K category are particularly noteworthy, surpassing those of the other SSDs tested. Under this benchmark test, the score of OCZ’s ARC100 ended at approximately 4200, and its IOPS scores for the most part were impressive. The SPS85 SSD that we received from Silicon Powers this year features a total capacity of 240GB and MLC NAND Flash. When tested with AS SSD, Silicon Power’s SP S85 showed a mostly remarkable performance, especially in the 4K category. The SSD’s total score, by the end of the test, was around 1227. 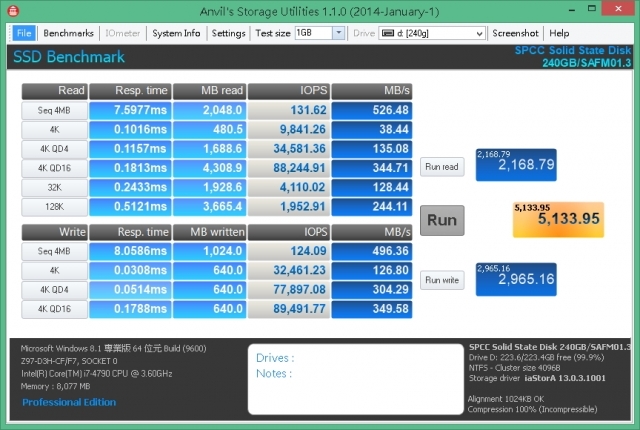 Under Avil’s Storage Utilities test, the SP85 showed a score of over 5100, and its IOPS scores were mostly impressive. Silicon Power’s 240GB SSD performed remarkably well under CrystalDiskMark, and showed very good results in the Seq writing category. Due to their ideal storage capacities, both the 240GB and 256GB SSDs are considered suitable for mainstream consumers and for gaming and business computers. Their performance can be enhanced considerably when equipped with the right type of processor.